Event Description : ‘Displace’ which is presented at Korean Cultural Centre is portraying Bangladesh through the lenses and artworks of photographer and artists. The exhibition explores the place variously referred to as Bengal, East Pakistan or Bangladesh at different points in recent history. The exhibition presents the works of 10 artists and 1 research collective from Bangladesh and is co-curated by Tanzim Wahab and Hadrien Diez. Total 11 bodies of work are displayed in various forms such as drawings, video and video installations, photography, etc. (Dis)Place is structured around various areas of disagreements, each framing questions connected to the general line of inquiry while they also open specific discussions. It touches upon topics as urgent to Bengal and Bangladesh as they are to the world: shifting environments, migration, marginalisation, economic and/or cultural appropriation. The exhibition further discusses related issues of borders and place(s) ownership, and of utopian sensibilities vis-à-vis forced displacements. The Korean Cultural Centre is an suitable place to portray many aspects of Bangladesh as Korea has also suffered terrible times. Kim Kum-pyoung, Director of Korean Cultural Centre India, highlighted the topic of the exhibition that can be related to people not only from Bangladesh but also from India or Korea through various art forms. He mentioned that KCCI intends to bring various exhibition practices from SAARC countries to address the notion of the region. 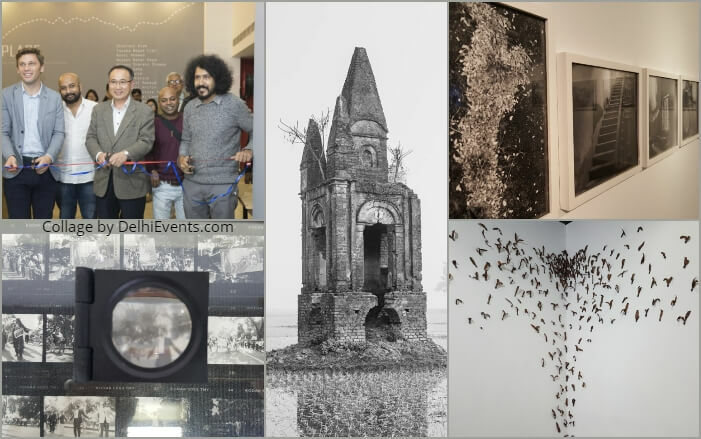 Talking on the exhibition Co-curators Hadrien Diez & Tanzim Wahab: Being awarded the first FICA South Asia grant for exhibition making presented us with a dilemma. We naturally felt that our project would have to touch upon Bangladesh, the place where we are active as curators and where our practice is rooted. At the same time, we were wary of the postcard effect under which we would present an exotic somewhere else to foreign audience while eschewing essential topics that would normally have found place in other of our projects. The solution came as an evidence: we would discuss a place, that of Bengal/Bangladesh, of which the many historical and geographical particulars would provide a fertile ground for polemics, while also discussing place as a general idea. Our first source of inspiration was the work of a long list of artists, those we present in the exhibition and others whom we did not have enough space to include. We are grateful to all of them. Our research has also been spurred by the work of various writers and thinkers, and singularly that of Edouard Glissant whose postulate of a fertile relationship between the particular of place and the total of all places – the “Whole-world” – has had a profound impact on this exhibition.